After an extensive restoration project, Mackintosh's only surviving Tea Rooms for local tea entrepreneur Miss Kate Cranston opened to the public on the 2 July 2018. During the summer Mackintosh at the Willow will have a phased opening, with all areas fully open from September 2018. The Tea Rooms, Retail Store and Visitor Information Centre are now open. The Exhibition Centre will open from late August. 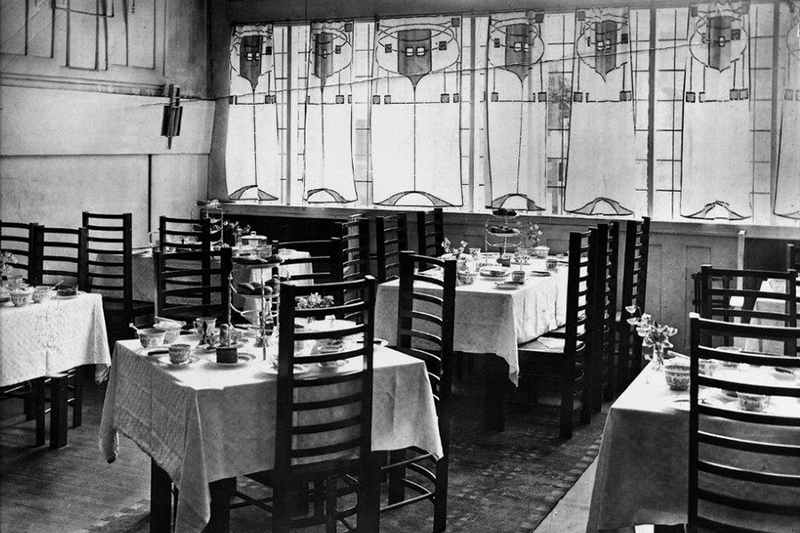 The original Willow Tea Rooms in Sauchiehall Street was designed by Charles Rennie Mackintosh for Kate Cranston in 1903. Not only did he design the exterior and interior he also designed the cutlery and waitresses dresses. The Room de Luxe is one of the most precious interiors which Mackintosh ever designed. the room today still has the original pair of stained glass doors along with the leaded mirror frieze with purple panelling below and windows with panels of leaded mirror, the furniture is silver with high back chairs with nine inserts of purple glass. The Gallery on the mezzanine floor overlooking the back salon has a fireplace on the back south wall. The ceiling has open beams allowing the light to flow through. The walls have a painted black trellis pattern with two stylised roses. For reservations at Mackintosh at the Willow check the website. The Tearooms are open daily, Monday to Sunday 9am to 5pm. Next to McLellan Galleries and 5 minutes walk from Glasgow School of Art. By Subway: 5 minutes' walk from Cowcaddens Subway. By rail: 10 minutes walk from Charing Cross and Queen Street rail Stations.